LOS ANGELES, CA (March 31, 2014) – Everyone’s favorite “Southern mama” reminds us why faith and family are so important in the hilarious new comedy Tyler Perry’s Madea’s Neighbors From Hell (The Play). Filled with inspiring gospel music, the newest stage play from blockbuster director, writer and producer Tyler Perry arrives on DVD (plus Digital Ultraviolet), Digital HD, Video On Demand and Pay-Per-View April 22 from Lionsgate Home Entertainment. Tyler Perry’s Madea’s Neighbors From Hell (The Play) pits no nonsense matriarch Madea and feisty neighborhood know-it-all Aunt Bam up against some troubled new neighbors and arrives on DVD after only one premiere performance weekend to packed audiences in Atlanta, Georgia. In the first Madea stage play since the fan-favorite production of Madea Gets A Job, the side-splitting performance, taped in front of a live audience, comes on the heels of the recent theatrical release of Tyler Perry’s A Madea Christmas. Not available on tour, the DVD is the only way that fans can watch the always uproarious Madea show her troubled neighbors that love and forgiveness are at the heart of a family, and that their faith will see them through to a brighter future. Tyler Perry stars as Madea, and is joined on stage by Cassi Davis (TV’s House of Payne) as the irreverent Aunt Bam and Wess Morgan (Laugh to Keep from Crying). Madea’s neighborhood takes a turn for the worse when a foster mother moves in with her unruly kids. Suspicious activity leads Madea to take justice into her own hands. With Aunt Bam by her side, Madea uses her unique wit and wisdom for unforgettable results. 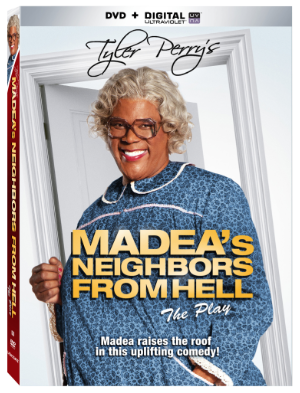 Featuring moving new songs written by Tyler Perry and performed by the cast, the Tyler Perry’s Madea’s Neighbors From Hell (The Play) DVD includes a behind-the-scenes featurette and will be available for the suggested retail price of $19.98. Title Copyright: © 2013 TP Entertainment, Inc. Artwork & Supplementary Materials © 2014 Lions Gate Entertainment Inc. All Rights Reserved. Tyler Perry is an established American actor, director, screenwriter, producer, playwright, and author. Born into poverty and raised in a household scarred by abuse, Tyler fought from a young age to find the strength, faith and perseverance that would later form the foundations of his work. Tyler started his career writing plays, many of which later became the inspiration for his film projects and included the introduction of the now-legendary Madea character, played by Tyler himself. Tyler’s first feature film, Diary of a Mad Black Woman, debuted at number one nationwide in 2005. His ensuing films, Madea’s Family Reunion, Daddy’s Little Girls, Why Did I Get Married?, Meet the Browns, The Family That Preys, I Can Do Bad All By Myself, Why Did I Get Married Too?, For Colored Girls, Madea’s Big Happy Family, Good Deeds and Madea’s Witness Protection have all been met with massive commercial success, delighting audiences across America and around the world. He also starred in the Rob Cohen directed Alex Cross, helped release Academy-Award nominated Precious, and has a role opposite Ben Affleck in David Fincher’s forthcoming film, Gone Girl. Tyler has also made his mark in the television space, with the TBS series House of Payne and Meet the Browns, in addition to his collaborations with Oprah Winfrey on her cable network, OWN. Tyler will next be seen in The Single Mom’s Club, which he also directed. He was recently nominated for “Entertainer of the Year” by NAACP. Lionsgate is a leading global entertainment company with a strong and diversified presence in motion picture production and distribution, television programming and syndication, home entertainment, family entertainment, digital distribution, new channel platforms and international distribution and sales. Lionsgate currently has 34 television shows on 22 networks spanning its primetime production, distribution and syndication businesses, including such critically-acclaimed hits as the multiple Emmy Award-winning Mad Men and Nurse Jackie, the comedy Anger Management, the network series Nashville, the syndication success The Wendy Williams Show and the critically-acclaimed series Orange is the New Black. Its feature film business has been fueled by such recent successes as the blockbuster first two installments of The Hunger Games franchise, The Hunger Games and The Hunger Games: Catching Fire, A Madea Christmas, Now You See Me, Kevin Hart: Let Me Explain, Warm Bodies, The Expendables 2, The Possession, Sinister, Roadside Attractions’ Mud and Pantelion Films’ breakout hit Instructions Not Included, the highest-grossing Spanish-language film ever released in the U.S.
Lionsgate’s home entertainment business is an industry leader in box office-to-DVD and box office-to-VOD revenue conversion rate. Lionsgate handles a prestigious and prolific library of approximately 15,000 motion picture and television titles that is an important source of recurring revenue and serves as the foundation for the growth of the Company’s core businesses. The Lionsgate and Summit brands remain synonymous with original, daring, quality entertainment in markets around the world.